Are you an early bird who springs up every morning to seize the day? …Or does getting up require some serious snooze button before you're even mildly functional? Whether you’re a morning person who jumps up at 5am -OR- you need 17 gallons of coffee to get going, you can still make your mornings much better with a few simple morning routines. Heads up: Establishing a morning routine doesn't turn you into a robot (and hey, life HAPPENS, so you gotta roll with the punches). Routines simply make your life easier. Now doesn't that sound pretty great? 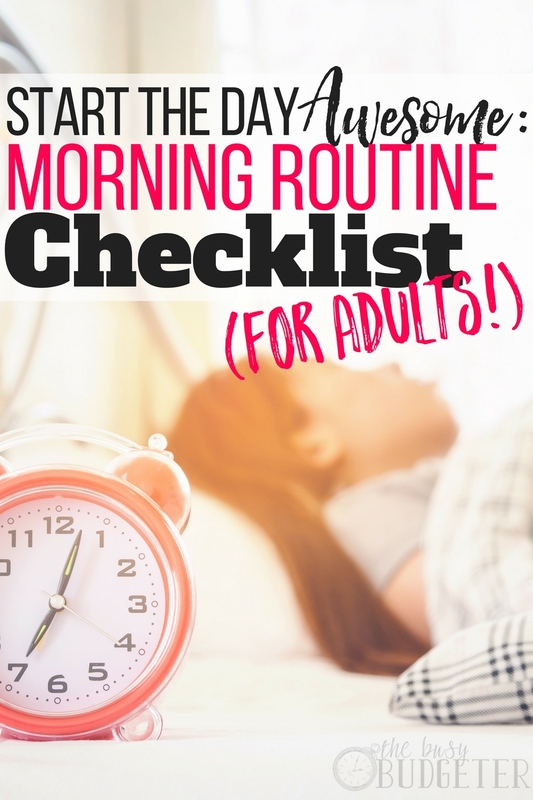 Get your FREE Morning Routine Checklist for Adults printable: CLICK HERE. Even the earliest risers struggle to find a perfect morning routine. Inevitably, stuff just happens—a cranky toddler, a shirt that looks funny once it’s off the hanger and on your body, or missing keys you can’t find no matter what. We’ve all had one of those frazzle-dazzle mornings where nothing seems to go right—even if you set the alarm to go off an hour earlier than usual! 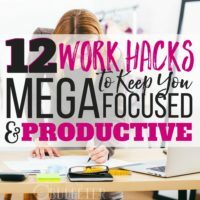 By the time you get in the car or get everyone out the door, you’re stressed out, tired, and ready to go back to bed (or just wishing for a do-over). Here’s the thing: morning routines help. BIG TIME. Even though routines can seem boring or stifling—or just lofty, especially if you aren’t a Type-A person—routines can still help tons. Embracing a daily morning routine can help ease the stress because you won't have to “think out” your next move before you've had your coffee. It helps to know exactly what to do next, even when things go wrong. Routine becomes more like muscle memory: Grab coffee, get dressed, grab lunch out of the fridge, get your keys from their spot, and get your buns out the door. There’s no need to think it through because it’s just, well, routine. It’s when we break the routine that things go awry. When we wake up at a different time, when we have to remember to do something or take care of whatever before we hit the door, or when we try to take on too many morning activities. That’s why having a morning routine checklist (for adults!) or just a regular morning ritual is so helpful—it gets us into “good habit mode” where we just do things automatically. 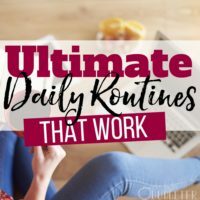 So whether you’re a morning person or a night owl, you can embrace regular, daily routines to help you get a better start every single day. You’ll get things done in the morning AND have more energy when you leave the house. You’ll feel ready to start the day awesome! 1. Plan your morning at night. While this isn’t just limited to mornings, setting yourself up for success with a few bedtime rituals ensures you'll get out the door that much easier. 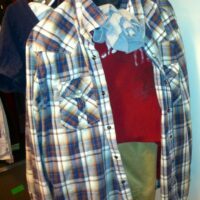 Put out your clothes the night before (and check to make sure things go together when you’re not rushed), throw your lunch in the fridge, and check that your bag and keys are by the door. Forgot to do it the night before? Take a quick inventory before you leave. When you turn the doorknob, get in the habit of asking yourself, “Do I have my keys? My wallet? Anything else I’ll need for my day?” Even taking a 15-second inventory can help you get out the door in one (happy and whole) piece! 2. Set your wake up time. 3. Choose an alarm you can live with. Rather than picking the most annoying alarm ever (why torture yourself with a foghorn or barking dogs?? ), try waking up to music, an alarm that slowly gets louder and brighter, or sounds you find pleasant. (If you use your phone as an alarm, try a handy wake-up app.) Open the curtains and let in the morning sunshine and light to help get your internal clock moving, without assaulting your ears or feeling like you’ve been jolted awake. Drinking a glass of water in the morning (yes – before your coffee!) is a great way to get your body geared up for the day. Our bodies NEED water, so after resting for a night, a large glass of cold water will wake you up from the inside out, triggering your digestive system, your brain, and your muscles. You’ll feel more fresh and less groggy. Add some fresh lemon to your water to give your body an extra boost of refreshing vitamins and flavor. It’s simple, but effective! Mornings can be hard, so the temptation to crawl right back under the sheets and snooze a little longer can be tempting. Making your bed will motivate you to stay out of bed once you get up! 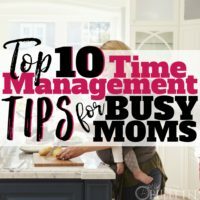 Tuck your sheets and blankets in tight, fluff the pillows, and move on with your morning feeling more organized and in motion. Imagine how satisfying it will be to pull the covers back and crawl under the sheets when it’s time for bed in the evening! Exercising in the morning is the best way to get the blood flowing, but not everyone has the ability to wake up extra-early to fit in a workout before the day starts. Try to spend 10 to 15 minutes every morning doing some kind of physical activity. Whether that’s a quick walk around your neighborhood, a run on the treadmill, or some jumping jacks and stretches while making breakfast, it’s important to get your body moving! DO NOT check your email or social media, ESPECIALLY IN BED. This one can be hard, I know. You wake up and the first thing you do is check your notifications. Don’t do it! Checking social media and (especially) emails first thing can totally get your day off on the wrong foot. Studies suggest that waiting until later in the day (or when you’re already at work) will lower stress levels and increase positivity, ensuring your morning is significantly easier to manage. 8. Sneak in a little me-time. This might be hard in a crazy family household, full of kids and a spouse rushing out the door, but it’s so worth it to spend a few minutes alone every morning. Try to sneak in ten minutes with just yourself. Get your thoughts in order, but don’t think too far ahead and stress yourself out for the day. Think positive thoughts and enjoy a few moments of me-time before greeting the chaos that may await. You’ll be more focused, calm, and collected. 9. Eat a healthy breakfast. If you didn’t already know, breakfast IS the most important meal of the day. You should eat a healthy, balanced breakfast every day – and don’t stress about cooking it! There are tons of simple and fast 15-minute breakfast recipes perfect for starting the day with your family. Don’t have time to prep breakfast? Try this recipe for freezer breakfast sandwiches. Whip these babies up ahead of time, pop them in the microwave for 90 seconds, and you’re good to go! Music can inspire us and help us feel ready to take on the world. When you need to feel energized, you can amp up your mood by listening to something catchy—pop music, rock, whatever speaks to you—and make it part of your morning motivation. What songs help you feel ready to take on anything? Listen to them in the morning to boost your mood and get pumped for the day! Let’s face it: mornings can be rough, even for the perkiest folks. Embrace your new morning routine and add in some positive actions to ensure your morning goes smoother. It’s not about adding more stuff to deal with in the mornings, but rather, slowing down a little and starting your day out on a happy, proactive note. Tackle one or two of these morning habits to start, then work your way up to accomplishing all 10 before you walk out the door. Pretty soon mornings won’t feel like such a drag and you'll start the day on the ball and ready to roll! These are great tips that I use myself. I definitely agree with the alarm. I hate being jarred awake so my alarm is nice, soothing music that gently wakes me up and doesn’t leave me feeling jittery. I also tidy up as I go along in the morning. It’s awful to come home to the house in total disarray after a long day. Wash dishes that have been used or load them into the dishwasher and put away toiletries and makeup in the bathroom. I LOVE your ideas! I got in the habit of starting out wrong when I had a baby who NEVER slept. (He’s 3 and he’s just starting to sleep now!) It was so hard to get out of bed and so I waited until the last possible minute to slither out of bed. Now….I’ve just developed some bad habits! Your ideas are encouraging me and inspiring me to do better! I love the idea of not checking social media until later. That will be a hard habit to break but I’m inspired to try! I can totally relate to the baby thing – very understandable. It’s hard to get in the habit but it’ll be totally worth it! These are great tips for an awesome start to your day! I use to consider myself a night owl, but now I LOVE mornings. I’ve been making it a habit to wake up at 5 am most days, and I am able to get so much more done in my days. I started making my bed every day and it’s making a huge difference. My bedroom looks so much nicer and it sets the day up right! I always make sure to drink lots of water and have breakfast in the morning no matter how small the breakfast is. I’ve realized that habits set me in the rhythm and helps save lots of time. Sometimes I just feel like I’m wired to do all the routine stuff in the morning without even thinking about it. Sleep is a crucial part of our morning routines. lack of sleep can make you tired and impact your day. You must make sure you are having the required hours of sleep every night. That is, ensuring you have 7 to 8 hours of sleep every night. Research has shown that a consistent lack of sleep could lead to heart attack and stroke. You must prioritise sleep in this checklist. I love these suggestions! I’d also recommend taking time for silence. You can do this while drinking your water or reading or just sitting. Life gets so hectic, and having a few moments to just sit in silence it great for some inner peace.